1. Magnetometer readings using the sensor of you mobile device. 2. The ability to record these readings for a longer period of time. Magnetometer sensors are pretty common in mobile devices. They are mainly used to provide compass functionality, but since they also are very sensitive to magnetic fields in general, they can be used to measure such fields. The app relies on real sensor readings, so there's no "fake" or novelty features. But please note that the magnetometer sensor in your device needs to be calibrated regularly, in order to provide correct readings. Based on the strength on each axis, the app then calculates the total strength of the magnetic field, which is called the Magnitude. The Magnitude is colored with Cyan color in all diagrams. Since Earth has an iron core that spins, it constantly generates a magnetic field. This field is essential to all life on earth since it is our best protection against the radiation from the sun. Scientists recently discovered that Mars also had an earth-like atmosphere, but since Mars doesn't have a spinning iron core, the atmosphere decreased to such a degree that the planet now is barren and cold. Depending on where you are on the planet, the app will therefore pickup various degrees of the electromagnetic field that Earth produces. Normally it will be between 25 to 65 microteslas which is the same as 0.25 to 0.65 gauss ( 1 gauss = 0.0001 tesla ). Ensure that your device actually has a magnetometer / compass sensor. Google your device brand and model for the technical specifications. If the app doesn't show any readings at all, it is probably due to the lack of such a sensor. 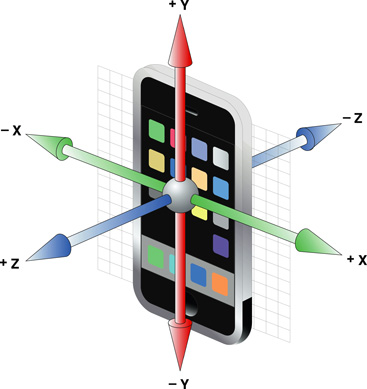 Ensure that the magnetometer / compass sensor in your device is properly calibrated. Start the app if you haven't already. Start the sensor monitor by tapping the big red play button which is located top-left on the screen. The app will now provide you with real-time measurements from the sensor. If the readings are below 65 microteslas, most of it is due to Earths background radiation. Readings higher than that indicate the presence of a artifical or natural magnetic field. Some devices filter out the magnetic field which the device itself produces, while others don't. Therefore readings can vary depending on which brand/model your device have. Things that emanate electromagnetic fields include LCD screens, microwave ovens, objects containing pure iron, electric motors and electronic devices in general. If you want to create a recording based on the sensor values, use the button right of the play button. When you start a recording, you have to choose the maximum duration of the recording. In the free version of the app, you can record for either 30 minutes or 60 minutes. The maximum recording limit can be upgraded in the in-app store to allow recordings for up to 48 hours. You can always stop a recording, regardless if the recording limit has been reached or not. Recordings are saved as structured data files. Please note that the files contain sensor measurements and not any sound, and are therefore saved in standard commaseparated (CSV) format. Files can be opened directly in the app, from the recordings screen. This will create a graph which shows the measurements strength per time unit. Files can also be opened in other apps, which can parse CSV files (typically spreadsheet apps). You can also send files by mail, from within the app.